09-Apr-2019 Verified Review, stayed from Thu Apr 04 to Sun Apr 07 2019 at a $189.00 group rate. Our hotel's fashionably appointed guestrooms, suites, and executive accommodations offer a long list of amenities designed to pamper, including our decadently comfortable Sweet Dreams beds, marble baths, and high-speed internet access. Many rooms feature private balconies with breathtaking views of the bay front marina or beautiful park. The Doubletree Grand Hotel Biscayne Bay provides resort-like amenities in an urban setting. Relax in the hotel's cloverleaf whirlpool spa, or bask on the palm-shaded deck surrounding our heated outdoor Olympic-size pool. Maintain your regimen in our state-of-the-art health club. Basketball and tennis courts, a jogging track, and a children's playground are available at the adjacent waterfront park. Our Concierge or Tour Desk at the Doubletree hotel will gladly assist with arrangements for private charter fishing trips, scuba, water sports, or junkets to some of the world's finest shopping meccas.Dining at the Doubletree Grand Hotel Biscayne Bay is a culinary adventure, with several enticing options reflecting Miami's vibrant diversity. Primo's, cozy and intimate, serves Italian cuisine and specialty pizzas. The award-winning Tony Chan's Waterclub is a favorite of locals and visitors, with an extensive gourmet menu and the freshest Sushi around. Le Faubourg Deli combines a French bistro with a Latin cafe, adding deli items and a grocery mini-market for our guests' convenience. Los Gauchitos Steak House serves the finest beef in the Argentinean tradition. Finally, the Bleu Moon restaurant and bar overlooks the bay and presents Fusion Mediterranean cuisine in a chic, romantic setting. No free breakfast.Average rate for a Plated American Breakfast is $10.00.A la Carte items as well. The Doubletree Hotels highlights above are subject to change without notice. 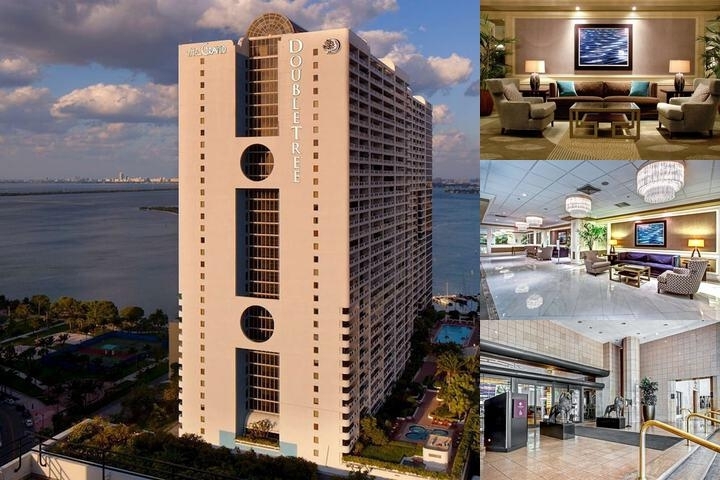 Below are the meeting, banquet, conference and event spaces at Doubletree by Hilton Grand Hotel Biscayne Bay. Feel free to use the Doubletree by Hilton Grand Hotel Biscayne Bay meeting space capacities chart below to help in your event planning. Hotel Planner specializes in Miami event planning for sleeping rooms and meeting space for corporate events, weddings, parties, conventions, negotiated rates and trade shows. 25 x 29 x 10 Ft.
42 x 25 x 10 Ft.
50 x 42 x 0 Ft.
42 x 40 x 0 Ft.
26 x 31 x 0 Ft.
25 x 42 x 0 Ft.
68 x 40 x 0 Ft.